Caring Community Friends kicked off 2019 with its first Board Meeting at Central Oklahoma Area Vocational Thursday, January 10. The Board welcomed three new members: Debra DuBois, Mallary Alsup-Goforth and Maxwell Lewis. “We’re excited about our new Board additions,” said Dr. Camille Teale, director of the local charity. “They’ll be instrumental in the development of several new services we’ll be offering in 2019,” she added. The organization is Creek County’s largest food pantry, serving the local and outlying areas with food, utilities, life-sustaining medications and emergency services when needed. CCF receives a monthly average of 33,000 pounds of food from local retailers, including shelf-stable goods, bakery goods, meat, dairy and fresh produce. In 2018, it distributed an assessed value of $700,000 worth of donated food to individuals, families, groups and partner agencies. It further provided over 15,000 bags of food to the highest food insecure students in ten area schools. Dr. Teale, who assumed directorship of the organization in 2017, has instituted several new innovations to its operation, including a Shopper’s Choice Food Pantry, a mini-grocery within the facility. Those needing food can weekly shop for what they want and need, using a normal grocery cart, without having to pay for it. Under her stewardship, a new service, the Book and Snack Mobile, a mobile library and food pantry will bridge the summer “reading” and “feeding” gaps. 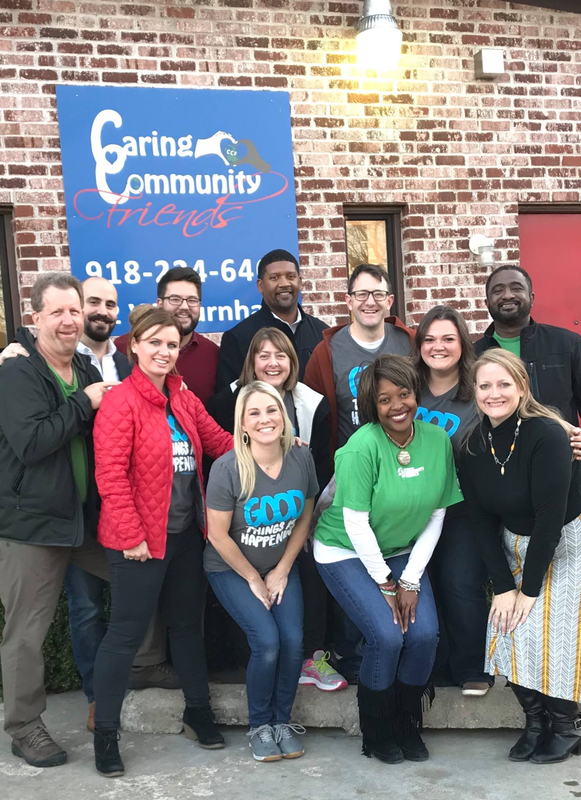 “Our new Board members are highly motivated and eager to help us successfully reach our goal… to reduce the impact of poverty in our community,” said Teale. Debra DuBois lives in Kellyville with 19 years of experience in the banking industry, presently serving as branch manager for Spirit Bank. She is highly involved in church work, including women’s prison ministry. She sits on both Salvation Army and Central-Tech Boards. She and her husband Robert have three children and three grandchildren. Native Sapulpan Mallary Alsup-Goforth, with degrees in accounting and business administration has performed as a senior tax associate for a major accounting group and assisted in the auditing of Securities and Exchange Commission clients’ tax provision work. She has extensive oil and gas industry accounting experience. As a Certified Public Accountant for a major petroleum corporation, she additionally works for a local family CPA firm. Her community volunteering activities include math and science tutoring as part of the No Child Left Behind program, Emergency Services, Junior Achievement, Salvation Army, United Way of Caring, and the Tulsa St. Jude’s Dream Home. She and her husband have two daughters. Maxwell Lewis, educated in commercial art and journalism has lived in and nearby Sapulpa since 1972. As an artist, he served as a package designer for both food and automotive products, and as an art studio owner/partner. He served as an account executive in three advertising agencies. Later, he served as a sales manager for a housing manufacturer and retired as an advertising (sales) manager representing five scientific publications produced by an international earth sciences association. He also owned and operated a local restaurant for a short time. He has written four books (only one published) and a movie. He sits on the local Senior Citizens group board of directors and founded a memorial scholarship fund for local graduating high school band students. After retirement, Lewis volunteered food delivery to homebound seniors for 12 years and has volunteered at Caring Community Friends for almost two years. He and his wife Christine have two daughters, three grandchildren and two great grandchildren. Dr. Teale’s 2019 Community Caring Friends planned activities include: Book and Snack Bus operation, the creation of a community garden, the Retail Relief/Feeding America Partnership, the Fresh Market, the Michael Reid Memorial Run, the Food4Kids Backpack Program, its Senior Servings and Food4Seniors, its Shoppers’ Choice Food Pantry, and the Murder Mystery Dinner as well as volunteer, intern and Senior employment. The non-profit organization has served the Sapulpa, Kellyville, Kiefer, Oakhurst and Mounds communities for over 25 years. It is located at 12 W. Burnham Ave. in Sapulpa, phone 918-224-6464. Full information is available at www.caringcommunityfriends.org.